Felix lived with his family on Fulton Street. Grammar School was Lytton (on Middlefield & Lytton). Classmates included Ellen Weary and Lee Rogers. When Felix was ten, he used to shoot jackrabbits south of Embarcadero, at edge of the bay. You can still see jackrabbits there. There were Orchards – apricots, applies, citrus, and Bing cherries. In Midtown, one can still see some of the old lemon and apple trees. At Christmas Felix enjoyed seeing Santa Claus coming down University Avenue in a sleigh. There was always a big Parade, with candy and little toys for kids. Palo Alto had about 5,000 residents and all the merchants and all the kids participated in the event. He also remembers a tradition that still persists today – the May Fete. As a kid he took his dog in a wagon for the May Fete parade. One day he backed the car out of the driveway on Fulton Street and “Curley” the motorcycle cop was right behind him. Curley talked to Felix’s Mom, and then started writing something. Turned out he decided that Felix would have to get a license so that his Mom would have someone to drive her places, so Felix got his driver’s license at age 14. 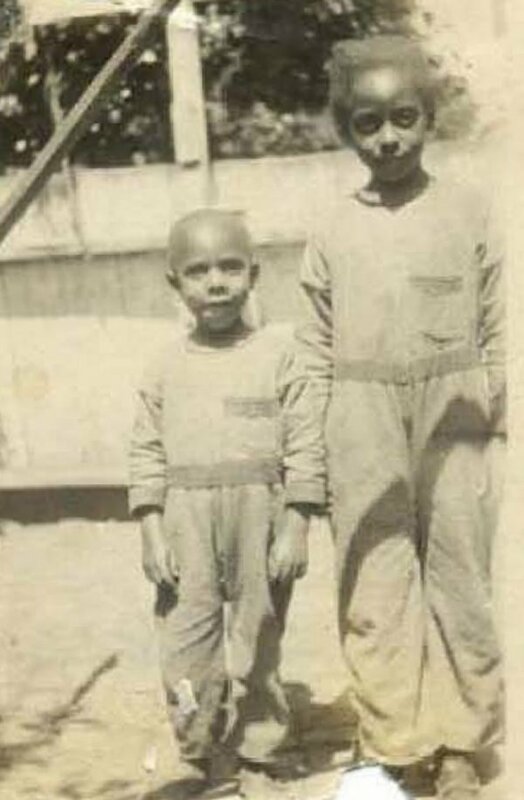 There were only a few Black kids around when Felix was young. They played among themselves, not with the white kids. 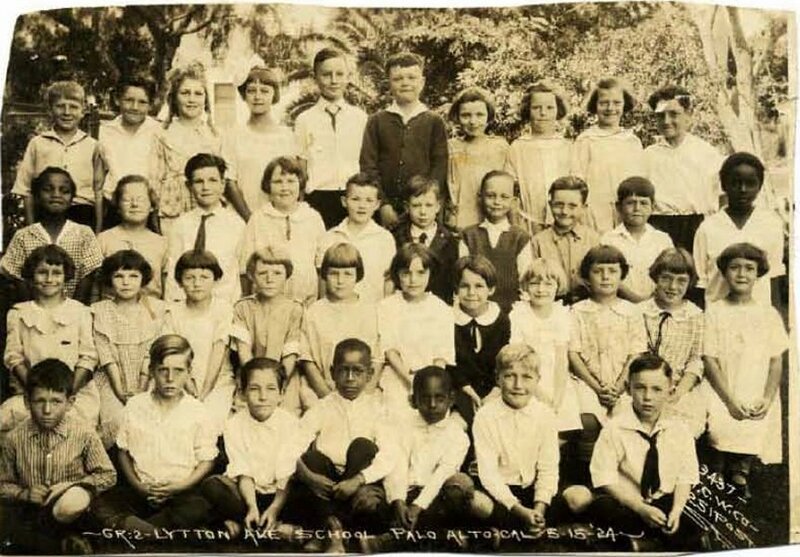 But at Lytton School, Felix played with all the kids. At Palo Alto High School there was less social mixing; Felix was not invited, as other kids were, to participate in student government. When he went to San Jose State, there was a lot of discrimination – he couldn’t even join clubs at SJ State. And in the early days in PA, there was geographical segregation – Japanese in one area, Blacks in another. Felix quickly added that it is different now. 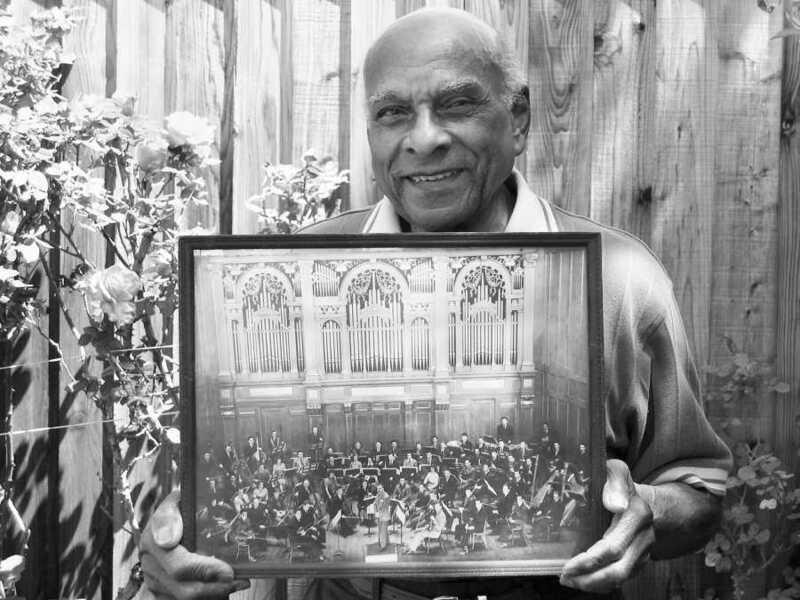 After attending San Jose State for two years, majoring in music, Felix went to New York, and played in the NY Civic Symphony, followed by playing in the Boston Youth Symphony (under Arthur Fielder) when he was 22. He still plays the trumpet and enjoys writing cadenzas. While in New York, he played a few gigs. He went into one place after midnight, was playing his trumpet when another guy came in back and played, too. It was Dizzy Gillespie – fantastic. During the war, Felix worked building ships at the Western Pipe & Steel (fondly called “Western Swipe & Steal”). He met his wife Phoebe when she came to California from Illinois. Their mothers were friends from church. And, well, the rest is history. Married in 1948, he and his wife lived on Fulton Street for two years. Felix worked on the Pepsi Cola Scholarship Board, and then moved to SRI, where he worked from 1948-1980. He started in the photo department, doing report duplication. He was promoted to supervisor and eventually to Manager of Report Production Department. Felix was active in several organizations. In the late 30s and 40s, he was a member of the NAACP, and active in the Palo Alto Fair Play Council. It was hard for members of most ethnic groups to buy a house in Palo Alto. When Felix was 14, his mom wanted to build a new house on Fulton Street – someone else had to get it for her and transfer it to her name later. In 1953, the GI resale program made it possible for Felix and his wife to buy their home on Waverley Street (where he still lives today). The first night, Felix was worried and had Phoebe sleep in the back bedroom away from the street. Their physical safety was not a problem, but a week after they moved in they observed a ‘for sale’ sign in a neighbor’s yard. Then two more signs -- and all three families moved out. However, Felix has several neighbors that have lived close by for decades, and he has maintained life-long friendships with three of them. He and Phoebe raised four children in their Palo Alto home. Felix was a Reserve Police Officer for ten years – late 40s through late 50s, under Chief Zink. It was a small police force, so they needed volunteer reservists. Felix patrolled all over. On University Avenue, there was a horn on top of a building – you could hear that horn all over. When it blasted, the reservists would go to the Police Station at 450 Bryant. Felix rode in police cars with the regular officers. He checked on homes while folks were on vacation. His four children grew up with a lot of church activities. AME Zion Church was started at 330 Cowper (at Grandma Alvina Ford’s house) then moved to Ramona Street, and finally to Middlefield Road. Felix taught Sunday School for 10 years. The kids did picnics, Christian Endeavor (a discussion group for kids every Sunday). The Natis family traveled all over the US in the station wagon, visiting parks, towns, everything. The kids still talk about it. In those days one had to be careful about accommodations. But there was a “Green Book” which was a guide book to accommodations where Blacks were welcome. One time, in New York in the rain, with no reservation, they found accommodations for all four of them – in a Penthouse room – for the same price as a regular one! Approaching his 89th birthday (May 2006), Felix reminisced a bit about Midtown in the old days. At the corner of Loma Verde & Middlefield there was a roller skating rink (where Century Liquor is now). Before that, there was a vegetable/grocery store. Lucky grocery store was on Alma Street before Albertson’s. There were several gas stations, a Co-op grocery store and a Wells Fargo Bank. A lot of businesses have come and gone. As a long-time resident of the city, Felix is in the Palo Alto Centennial Book, featured on page 289. But Felix loves Midtown. He thinks the people are good. He likes the diversity. He can walk to Midtown for the newspaper, and people are friendly and say hello. He appreciates the trees, activities, beautiful parks, conveniences, and nice homes. What does Felix do for fun? He plays classical trumpet still, but just for himself. (His only regret is that he didn’t pursue a symphony career.) He gardens and takes care of all the household chores. He stays in touch with his children and grandchildren. He also likes going fishing at the Delta or Los Banos. Catfish is a big favorite – his favorite recipe is to pan fry, cover with salt & pepper and yellow corn meal. He took up fishing late in life, and goes with his son when he can. Felix also has many dear friends and neighbors, and has maintained many life-long friendships.